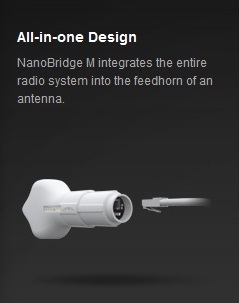 Ubiquiti?s revolutionary InnerFeed technology integrates the entire radio system into the feedhorn of an antenna. 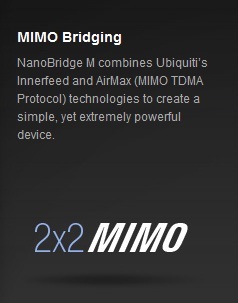 NanoBridge M combines Ubiquiti?s Innerfeed and AirMax (MIMO TDMA Protocol) technologies to create a simple, yet extremely powerful and robust wireless unit capable of 100+Mbps real outdoor throughput and up to 30km+ range. 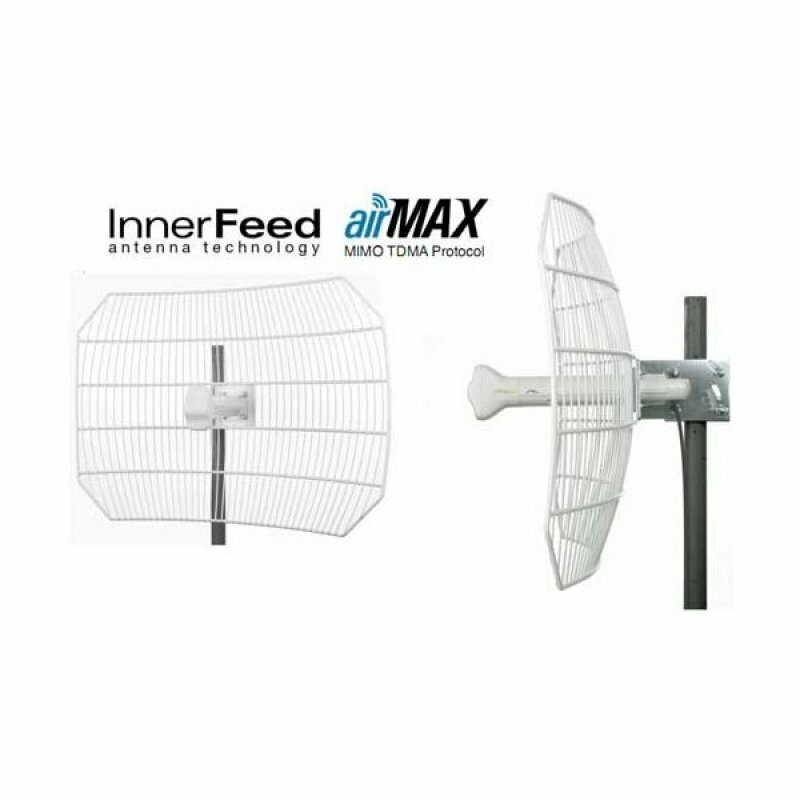 Complete antenna and radio system integration provides revolutionary cost/performance solutions to the Worldwide Broadband Industry. The low cost, hi-performance, and robust ?all-in-one? design of NanoBridge M make it extremely versatile and ideal in several different applications (see diagrams on right for some usage examples). 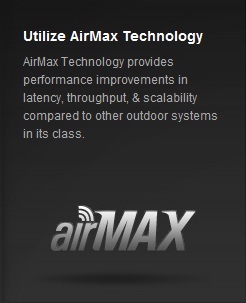 Unlike standard WiFi protocol, Ubiquiti's Time Division Multiple Access (TDMA) AirMax protocol allows each client to send & receive data using pre-designated time slots scheduled by an intelligent AP controller. This "time slot" method eliminates hidden node collisions & maximizes air time efficiency. 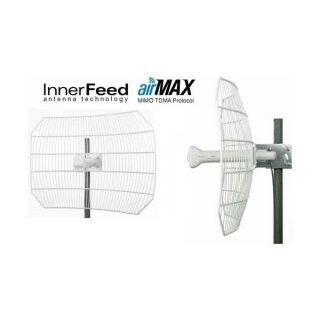 It provides many magnitudes of performance improvements in latency, throughput, & scalability compared to all other outdoor systems in its class. 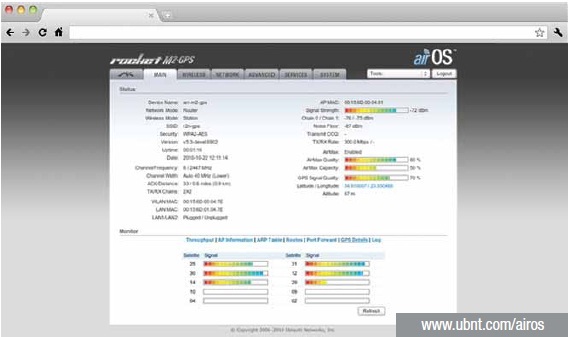 Intelligent QoS Priority is given to voice/video for seamless access. Latency Multiple features dramatically reduce noise. 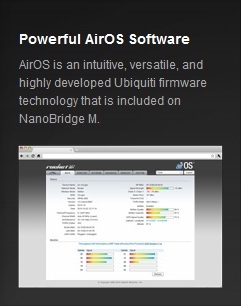 airOS: AirOS is an intuitive, versatile, highly developed Ubiquiti firmware technology. It is exceptionally intuitive and was designed to require no training to operate. Behind the user interface is a powerful firmware architecture which enables hi-performance outdoor multipoint networking. 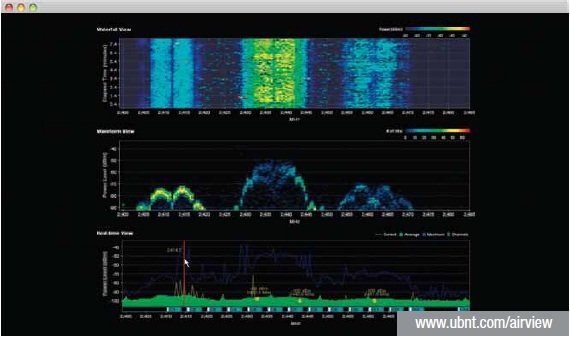 airView: Integrated on all Ubiquiti M products, AirView provides Advanced Spectrum Analyzer Functionality: Waterfall, waveform, and real-time spectral views allow operators to identify noise signatures and plan their networks to minimize noise interference. Waterfall Aggregate energy over time for each frequency. Real-time Energy is shown real-time as a function of frequency. Recording Automize AirView to record and report results. 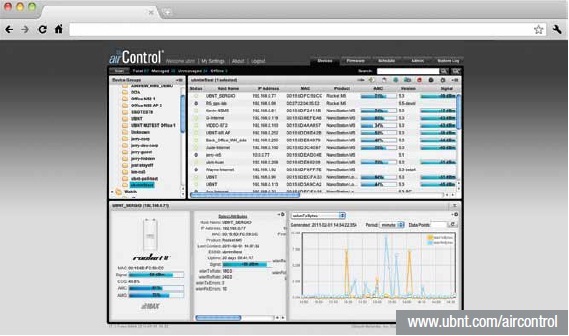 airControl: AirControl is a powerful and intuitive web based server network management application which allows operators to centrally manage entire networks of Ubiqutii devices. 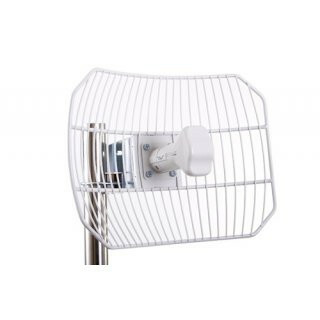 To use it as a WLAN-Bridge you need two airGrid M2!